I am a woman. I am an immigrant. I am Hispanic … born and raised in Mexico. I am a proud mother of two and, for the past 10 years, an entrepreneur. All of these titles together would make my success story a statistical anomaly for any woman in 2018. It took me seven years to receive a paycheck from my business, Half Moon Empanadas. More than 10 banks declined to finance our outpost at Miami International Airport. After a couple of evictions and the word “no” became a constant. I responded the only way I knew how: I worked hard, I dreamed high and I never hesitated to ask for what I needed. I reached out and found some doors that opened. I am pleased to say that Half Moon now has 10 locations in South Florida and, in 2017, our airport location was the best seller per square foot. More importantly, we offer employment to more than 50 people, 70 percent of whom are women. My story is a work in progress. Success didn’t come overnight. When it did, even looking back on the hurdles I overcame, I still felt that I wasn’t successful enough. I am not sure how much it was my overachieving self, or just what we all feel as women. 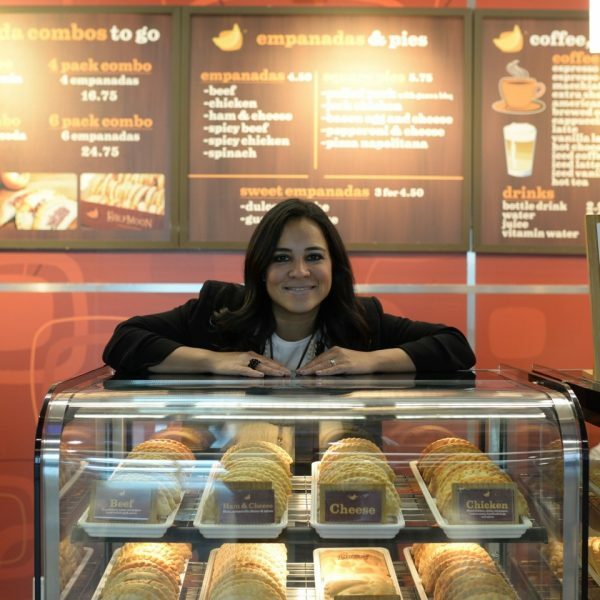 Pilar Guzman, CEO and owner of Half Moon Empanadas, stands behind the business's display case at Miami International Airport. This was an inflection point for me. I realized the power of my words and of my example, and the responsibility I had to my community and to other businesswomen like myself. I decided that I was going to OWN MY SUCCESS and that I would share my story with other women. There are about 27 million firms in the United States. Thirty percent of these businesses are owned by women, but only two percent break $1 million in revenue. Those owned by men are 3.5 times as likely to reach that million-dollar threshold. We can change this statistic if we put heart and hard work into our vision and believe in ourselves. Our voice matters. It is okay to ask for the opportunities we know we’ve earned. It is okay to negotiate for the salary we believe we deserve. It is okay to be a working mom; our kids will grow up proud of who we are as we lead by example. Mentors and hard work are key. Institutional support is important. But no other factor is more important than the realization each woman has her own value. If you’re a female entrepreneur in Miami, there’s a network of organizations and successful women here to support you and help you scale your business. I am honored to serve as a mentor for some of them, including: WIN Lab Miami, FIU StartUp Food Lab and The Idea Center at Miami Dade College. Nonprofits like Venture Café Miami are also helping build a connected environment for women business owners to prosper. My vision for Miami is one where we are a more inclusive community. My vision for all women is that we each realize our power so that we are heard, so that we take more seats in the C-suite, so that we build more businesses and grow them. My vision for our children is that they will have better opportunities than we did. I believe strongly that entrepreneurship is an equalizer for any issue such as gender, income or race. It is a building block for creating the community we want to live in. I ask everyone reading this to engage other women, to mentor them, to support and participate in our programs. We must be intentional about it. That is the only way that we will create true, lasting change. Pilar Guzman is CEO of Half Moon Empanadas and a member of Miami Fellows Class X. So proud of you and all you have accomplished Pilar. You are an example for all women, no matter their experience or background. Congratulations, and keep climbing! Hi Belinda! Thank you!! You have always been an inspiration to me! Thank you for #leadingbyexample. Proud of Pilar! We are blessed to have Halfmoon empanadas on the FIU Campus. She is an inspiration to us all, especially women entrepreneurs! Thank you, Joan. Very kind of you. Fantastic article Pilar! Thank you for sharing your story. Thrilled for you and all that you have been able to overcome and accomplish. Cheers! P.S. Missing your original signature dulce de leche dessert…it was out of this world! Hope to see your empanadas in the frozen supermarket aisle of Whole Foods or Publix one day for the masses to enjoy. We still have the dulce de leche ones, but now as empanadas, not pastelitos. Stop by our store on 79 and Biscayne. You are an inspiration to women and to our community! Congratulations on your drive, determination and success!